I have found doing small ink pictures of sail boats is really fun but time consuming. Doing them in pointillism (small dots) does give a different look, but It is very labor intense. The use of this technique is an artistic rendering choice more than a media selection for best way to render this image. Many great pieces of art have been rendered in pointillism and in color as well. When in color the mixing is done in the human eye more than in the paint. 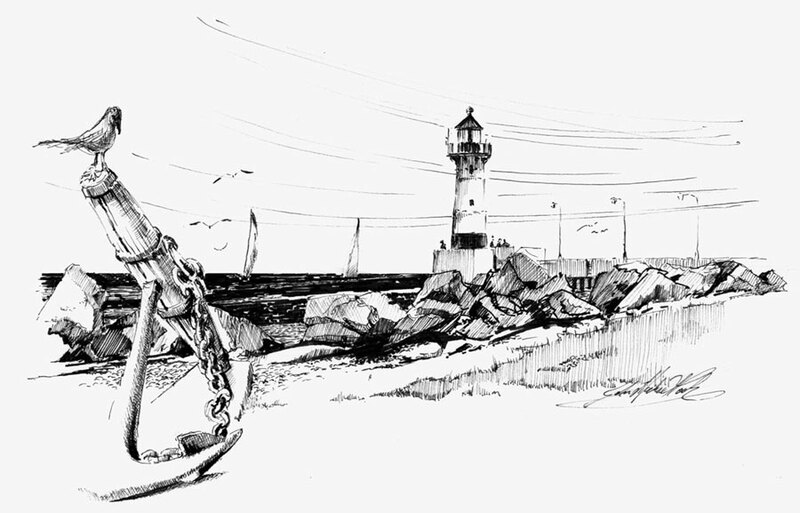 For black and white the grey tones are mixed in the eye as well and that is where the artist must use their experience to create a tonal expression of the image. This image is not a total pure pointillism image, there are pen line passages, and total black field fills within it. At best it is a mixed technique with major pointillism passages. 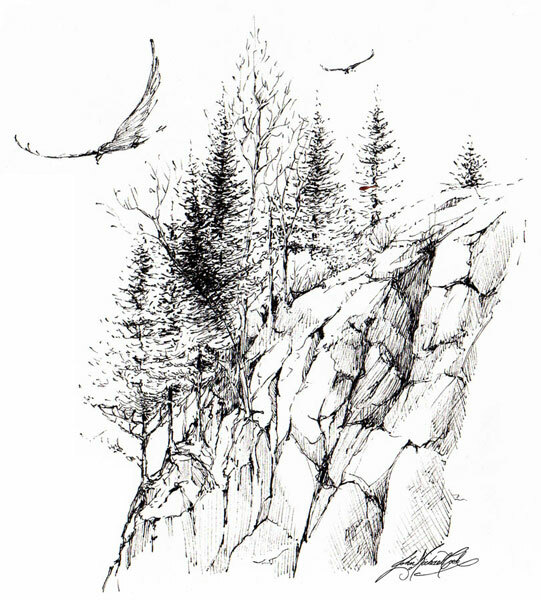 Pointillism often seems to point to the artist work and skill more than the image developed. The only time pointillism really works is when you don’t notice that it is pointillism or don’t notice the artists hand in it until you get done looking at the image and then see that it is rendered this way. I love doing pointillism, for a really successful image, the artist should disappear and the idea should emerge, when properly done the use of pointillism is fantastic. These images work better from a little distance. 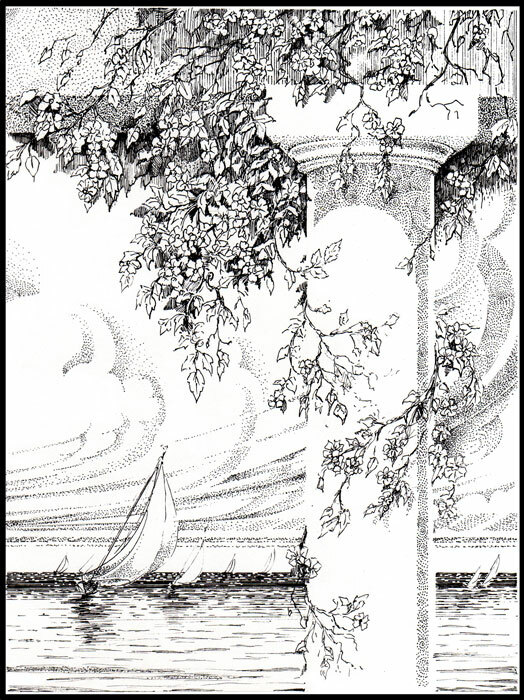 This entry was posted in BLOG--One Page True Tales, Gallery, HOME, Pen and Ink and tagged pen & ink, pointillism, sailboats on October 14, 2013 by eightdecades. 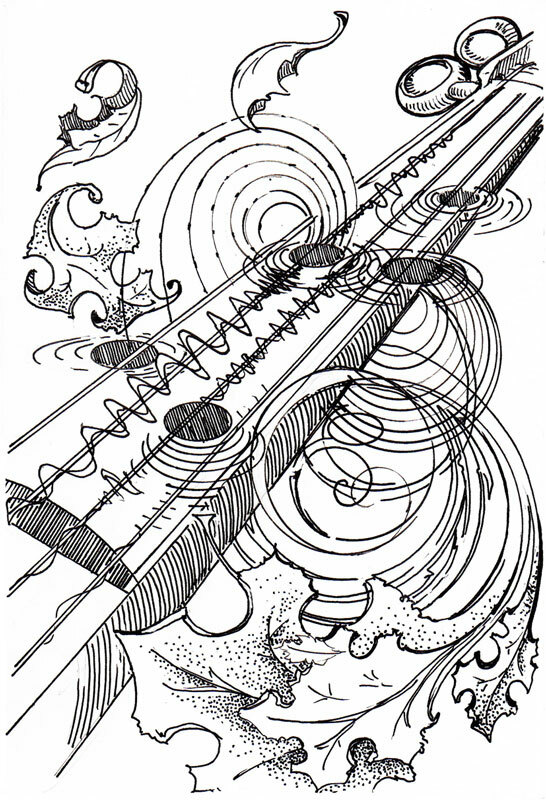 Started out as a doodle, became an abstraction and later was used as a program cover for Crescendo Youth Orchestra. I think all doodles are just journeys that are incomplete. With no destination or purpose in mind, a doodle begins to tell its own story. The rules of the world do not yield to this and begin to impose purpose and form into a shape. If you keep at it long enough, it becomes an abstraction of something. The paper responds by supporting the ink or the pencil marks, making a record of nowhere you are going, but only where you have been, until an image begins to speak its own identity. It may be a response to thoughts or a tale of hopes, or just a hand memory of motions, but if one keeps moving the drawing tool across the recording surface, the lines become a picture of some sort, defined by the page dimensions and the intensity of which marks are made. The mood you are in can guide it into a response or comment unknown at the beginning. This is no small event, because, like a hologram, every rendering contains every experience an artist has had, or hopes to have. 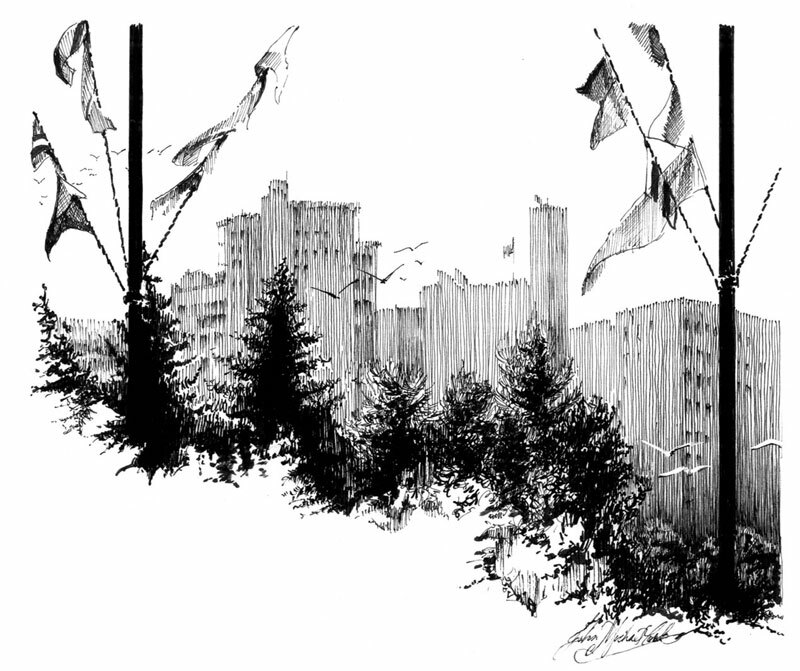 This entry was posted in Doodles and tagged abstract, MICRON, pen & ink on May 21, 2013 by eightdecades.